The Con Artists, starring KIM Woo-bin and LEE Hyun-woo, will be released in North America on January 9th, followed by five Asian countries. Within those, Taiwan has confirmed for the 23rd, while China and Hong Kong will screen the film in January, though fixed dates have yet to be determined. Singapore and the Philippines will release the film after the aforementioned countries. 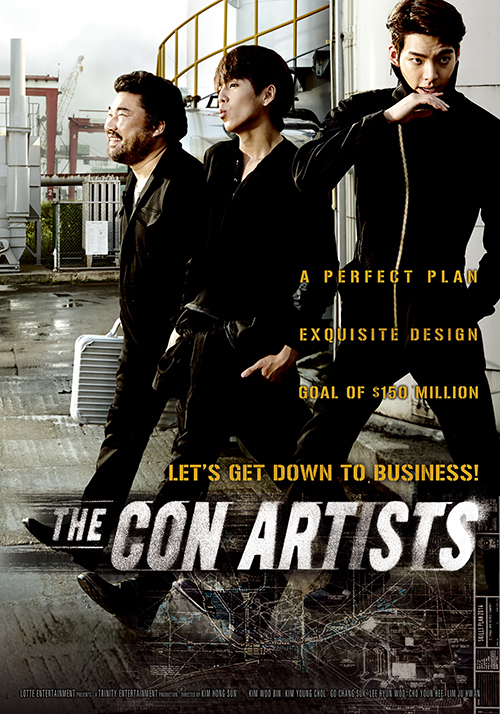 The Con Artists was presold to China, Hong Kong, Taiwan and the Philippines during the Asian Film Market last October. Deltamac, which distributed Secretly Greatly (2013) and The Suspect (2013) before acquiring The Con Artists, commented that “This is the kind of smart heist film which has been hard to come by recently. The action scenes with KIM Woo-bin and LEE Hyun-woo are very memorable.” Deltamac is looking forward to the release as many Hong Kong fans are said to be interested in the film. The Con Artists centers on the story of a mission to steal USD 150 million within 40 minutes at the Incheon Customs Center. KIM Woo-bin plays the brain of the team named Ji-hyuk, who is able to crack open any safe. GO Chang-seok is the social butterfly, Goo-in, who brings Ji-hyuk’s blueprint to reality, while LEE Hyun-woo transforms into genius hacker Jong-bae who gets the team through the building’s security systems. After releasing domestically on December 24th, the film has brought 2.25 viewers to theatres as of January 4th and is still going strong.